If you’re a “The Train In Vain” blog regular, you know that I like to use the parking facility at Hicksville. It’s close to the station platform, and there are plenty of spots available at the time I normally catch the train. 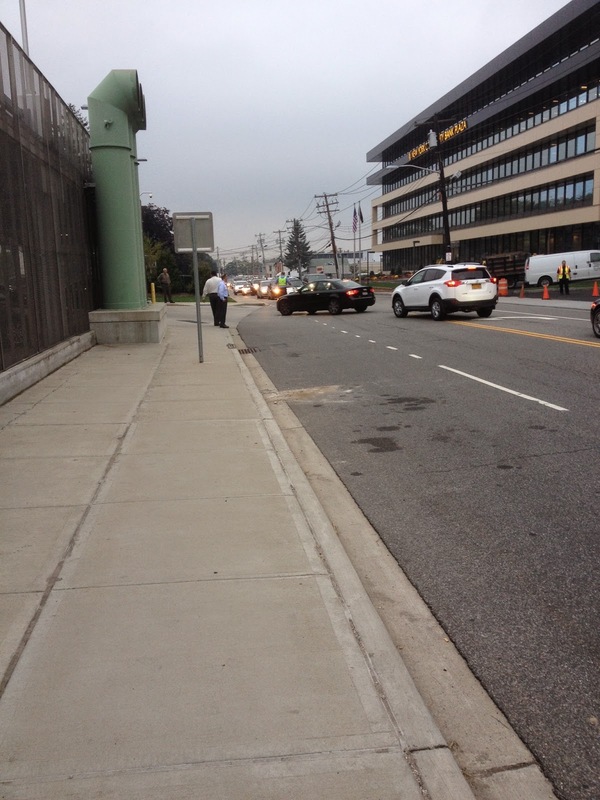 On most days, the Long Island rush hour traffic is pretty challenging, but today was worse, and UNNECESSARILY worse. See Exhibit A, westbound Duffy Avenue in Hicksville. The cars making left turns are entering the parking facility. The line of cars to make the left turn stretched back for over a mile. Because of the traffic, I missed my train. Take a look at the eastbound traffic (cars with headlights on). They’re backed up as far as I could see. What caused this congestion? 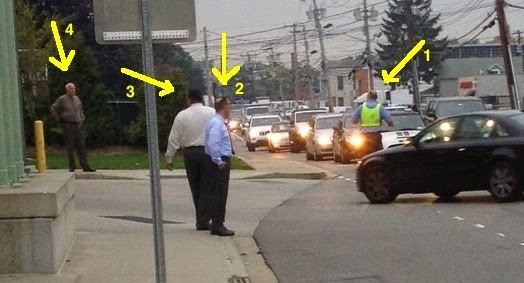 The Town of Oyster Bay decided to manually direct traffic into the lot. Without the manual direction, traffic in the area moves just fine. "If it ain't broke, we'll fix it!" That is the town motto. Let’s have a closer look at the crack traffic direction staff in Exhibit B. Person #1. He is directing traffic. He’s wearing a reflective vest, and holding back traffic in one direction while cars from the other direction enter the lot. Without his help, the traffic moves slowly. With his help, it’s a backed up mess in both directions. Not his fault. He’s doing his job. Person #1 is the only person actually working. Everyone else is wearing a tie. Person #2. He is watching intensely. His hand is in his pocket. He’s watching Person #1 direct the traffic. He’s doing a tremendous job. Person #3. I’m guessing he works for Person #2. He’s watching person #4. Person #4. My guess is he’s the boss. By staying aloof and away from #2 and #3, he has asserted his leadership. He won’t consort with the underlings who are also watching the traffic intensely. My money is that in this action shot, persons #2, #3, and #4 are thinking about breakfast. As I was writing this entry, my eleven year old son came over and saw me labeling the men in Exhibit B. Son: Dad, why are you putting numbers next to those guys? Me: These men were directing traffic at the parking garage. I'm writing a blog post about them. Son: All of them were directing traffic? Me: No. Just the man in the vest. Son: What are the other men doing? Me: Standing and watching the man in the vest. Son: That's all they're doing? Son: That's all they have to do? That seems like a great job. Me: Yes, I'm sure it is. And they'll probably have free healthcare and pensions in perpetuity. Tomorrow I'm parking in the far away lot. Or applying for a civil service job. In fairness, is anything more empowering than making cars stop?? ?